ANSEONG, Gyeonggi Province — "Cheonggukjang," or thick soybean paste, may be an acquired taste for some, especially young Koreans. But over the years, this often smelly, once expedient source of protein, has become popular for many reasons. First, packaged cheonggukjang is readily available for today's consumers, but small-batch cheonggukjang is also growing visibly. One artisanal cheonggukjang brand comes from Seoil Farm, which has operated since the mid-1980s and whose CEO, Seo Bun-rye, is also the nation's sole government-designated master of the food. The well-kept farm is expansive with an area of 30,000 "pyeong" or 99,000 square meters, and is home to an upscale, country-club-style edifice. While the farm's cheonggukjang has been well-known among some consumers for a while, it has reached a broader market recently and is selling out through home shopping channels. Whenever the product sells out, Seo, 71, said she bursts into tears of joy. "I promised myself I would not cry, but when it sells well, I feel overwhelmed thinking of the work we put into making this product, which is healthy and based on a traditional art form passed down to us by our ancestors," Seo explained. Seoil Farm's cheonggukjang is made using the traditional Korean method of natural fermentation using straws or open air for starters to grow Bacillus subtillis contained in the food product. It is beneficial for helping blood circulation, easing constipation and boost immunity. The health benefits and more efficient manufacturing process of cheonggukjang (compared to "doenjang," another type of soybean paste made using a longer manufacturing process) are the reasons Seo actively promotes it to all Koreans. "I want to make everyone, from children to youths to adults, to eat this health food that mothers are now afraid of making.," Seo said. 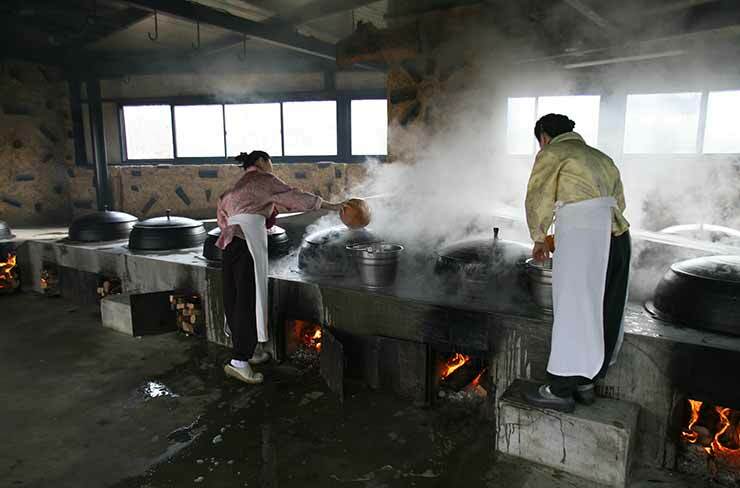 The key to making cheonggukjang lies in controlling the temperature and humidity, which is why most people are not up for the task. 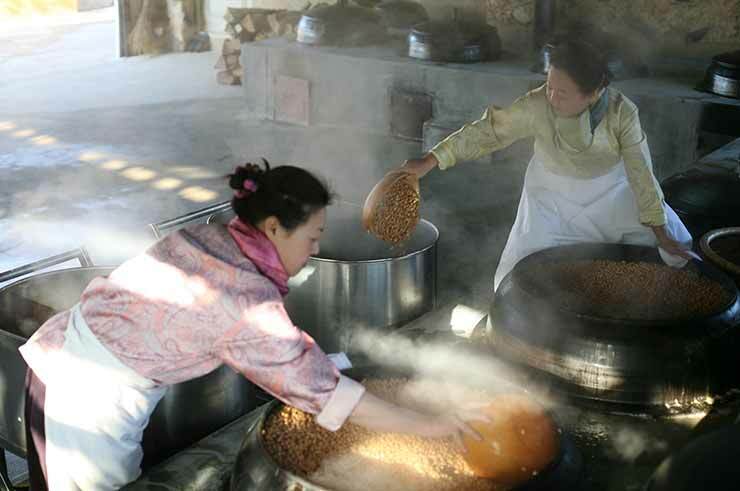 For her cheonggukjang, Seo uses quality beans from the year's first harvest. She adheres to the traditional process of making cheonggukjang for her products. When making it at home, she would boil about 5kg of beans for a long time and steam them for some time until they are almost mushy. Then, she lines a basket with cotton cloth, fills the basket with up to 10 centimeters of the boiled beans, sticks some straw over the beans to promote Bacillus subtillis, and finally, places a bath towel on top of that and then a blanket over the towel. Next, she performs an important step — she places an electric blanket, set to medium temperature, underneath the basket. Then, the beans are fermented for three to four days. She suggests for the beans an average temperature of 36 to 40. She advises packaging it in smaller portions in the freezer, and taking it out when needed. This homemade cheonggukjang can be eaten raw or made into a Korean-style soup known as "jjigae" by adding water, vegetables and some kimchi. Similar to Japanese "natto," this thick soybean paste is well-regarded for its health benefits. "For 100 grams of natto, there is about 150 miligrams of zymoprotein. For 100 grams of naturally fermented cheonggukjang, there is about 250 miligrams of zymoprotein." These health benefits of cheonggukjang are an added appeal to 21st century consumers. Seoil Farm has earned U.S. FDA approval for its non-smelly cheonggukjang. She said the key is to maintain an even temperature and humidity. Seo also makes doenjang, "gochujang" or red chili paste, and soy sauce. "I used to make doenjang better, but I realized how much faster it was to make cheonggukjang and how good its health effects were without being as salty as doenjang," Seo said. Seo, a native of Yeongdeok County in South Gyeongsang Province, worked at Korea's first designer shop, Nora Noh, in Seoul, where she met her husband, a journalist-turned-travel agency CEO. With her business sense, she turned around her husband's poorly operated travel agency. "I finish what I start, and I don't get swayed by other people's opinions. I am a little obstinate in that way," she said. She bought the farmland in Anseong in 1978, with initial plans to build an elderly care facility. She volunteered at a senior home facility in Seoul in her free time. In 1983, however, one of the patients at the facility died while she was at the center. The patient's death made her realize her volunteer work may have been for her benefit more than for the patients, and it was around that time she came to Anseong, letting her husband run the travel agency. She started to grow her own beans which she made into paste, after which people asked if they could buy them. Her business was doing well until the Asian financial crisis in 1998. She said she learned her lesson during that crisis when she had to sell her commercial 11-floor building in Gangnam to pay off debts incurred by her husband's travel agency and her farm. "I realized one should not exceed his or her own capacity," she said. Now she and her daughter, who is designated to succeed her as a cheonggukjang master, aim to operate the family business at its current scale of 30 employees. Seoil Farm posts around 7 billion won to 8 billion won in annual sales for its cheonggukjang, doenjang and gochujang. Its restaurant, Solee, is also highly popular, with lines of customers waiting on weekends. "We will not grow it any larger; that will be excessive ambition, greed. I am happy at this level," Seo said. Seoil Farm together with Anseong city government advanced into Pyongyang, North Korea, around 2008, where they built a factory; but since inter-Korean relations started to sour, she has not been back. She hopes amid the fast-pace reconciliation between the two Koreas, she will get the chance to reopen it.